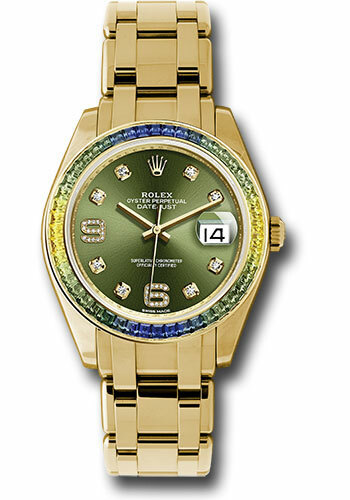 39mm 18K yellow gold case, screw-down back, screw-down crown with twinlock double waterproofness system, bezel set with 48 blue to green gradient baguette-cut sapphires, scratch-resistant sapphire crystal with cyclops lens over the date, olive green dial, 8 diamond hour markers, Arabic 6 and 9 set with 32 diamonds, Rolex calibre 3235 automatic movement, Pearlmaster bracelet with rounded five-piece links. Waterproof to 100 meters. 39mm 18K yellow gold case, screw-down back, screw-down crown with twinlock double waterproofness system, bezel set with 48 orange to yellow gradient baguette-cut sapphires, scratch-resistant sapphire crystal with cyclops lens over the date, cognac dial, 8 diamond hour markers, Arabic 6 and 9 set with 32 diamonds, Rolex calibre 3235 automatic movement, Pearlmaster bracelet with rounded five-piece links. Waterproof to 100 meters.